West Africa is no stranger to dope instrumentation. Legends like Fela Kuti and Toumani Diabate influenced the world by creating unique rhythms and melodies using the instruments of their home countries. Body-moving clicks, hits and rattling frequencies represent themselves throughout their arrangements, but what are these sounds and how are they made? Down below we dive into the instruments of West Africa, touching on sounds from Cameroon to Mali and everywhere in between. Check out the videos to hear the instruments and see how they’re played. The Kora is a 21-stringed instrument constructed from a large Calabash Gourd and covered with cow skin to act as a resonator. Though little Western classification can be placed to it, some associate it with the harpsichord family, calling it a “double-bridge-harp-lute.” Its beautiful range can be heard across West Africa in various countries such as Guinea, Mali, and Burkina Faso amongst others. The Shekere is a dried vine gourd covered in woven beads to produce a rattling sound when shaken. Although many variations and names of the instrument are made across West Africa, the Shekere is predominately associated with Nigeria. 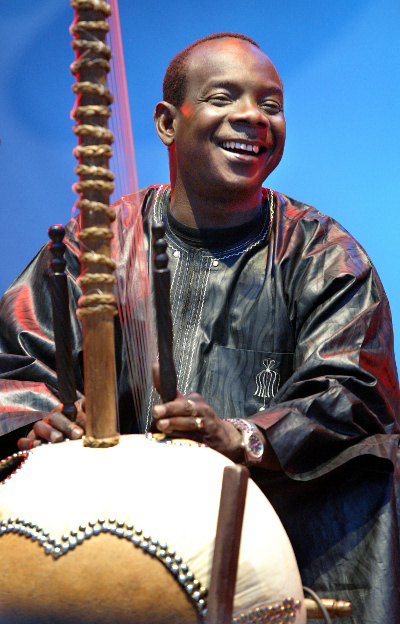 The Balafon is a wooden-keyed percussion instrument similar to a xylophone or vibraphone. It can be either be played in a fixed key (attatched to a wooden frame with Calabashes hung beneath) or free key (having wooden keys on any surface). Its rich sound is derived from the strike of a padded mallet to its carefully shaped individual keys. The inception of this instrument is linked to many West African countries such as Mali, Senegal, Cameroon, and Gambia just to name a few. Akuba is the name given to three small Yoruba congas which are played together in a complementary style. Played with sticks and hand alike, the Akuba drums often assume the lead role in the afrobeat sound, giving the musician the freedom to improvise and even direct dancers on stage. Also used in connection with the Nigerian Yoruba language, the drums help in complimenting the various tones of the spoken idiom. The Soku is a single stringed fiddle native to Mali. A. Malik McPherson for Okayafrica.com. With more than half the population in many African nations under 25, the bright continent is currently undergoing an explosion of vibrant new music, fashion, art and political expression. Okayafrica is dedicated to bringing you the latest from Africa’s New Wave.